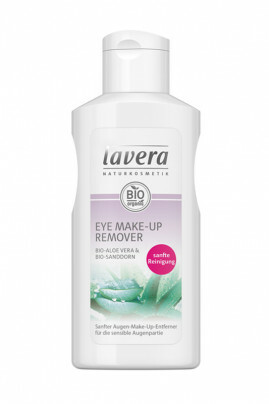 The Lavera Vegan Eyes Remover gently removes the eye and effectively removes all traces of makeup: mascara, eyeshadow, pencil ... Enriched with aloe vera and organic sea buckthorn extract with soothing properties, it soothes and relieves eyes. Particularly soft, it is very well tolerated and is ideal for sensitive skin. Your eyes are perfectly cleansed without being irritated! With Lavera Vegan Eyes Remover, the makeup removal step becomes a real moment of softness! On a disc of organic cotton or washable cotton, put a small amount of makeup remover. Apply it gently on the eyelids and eyelashes until there is no trace of makeup. Rinse with water if necessary. Do you want more sweetness? Put the makeup remover on a previously moistened cotton! Put it on your eye, press gently and after a few seconds, remove makeup by wiping once. A bio and vegan formula for gentle make-up removal!